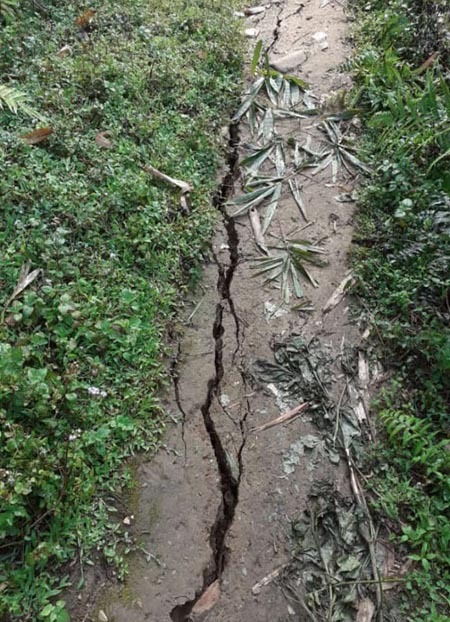 ITANAGAR, Jan 10: There is a very good reason why Aini Taloh’s phone is never switched off or even on the silent mode. The 56-year-old runs a voluntary blood donation organization, AYANG, and she is never sure when her services will be required. Aini, who is a popularly known as ‘Ayi’ (mother), and her volunteers have been at the forefront of voluntary blood donation in the state. Apart from organising regular blood donation camps in Pasighat, Aalo and Itanagar, these volunteers respond to emergencies when blood banks run out of blood. The fastest way to reach a blood donor is to send a WhatsApp message as Aini has formed groups dedicated to each blood group. “Rarely has it happened that we have not been able to provide help to patients,” she says. One may ask why Aini, a known social worker who has led from the front for eradication of drug abuse and treatment of drug addicts, and is working for women’s rights in the Siang valley, decided to dedicate herself to the cause of blood donation. She took the call after a life-changing experience. “I have been donating blood sporadically since 2008, but in 2014 I decided to dedicate my time to blood donation because of an experience that has stayed with me. I donated blood to a pregnant mother, and doctors said that it helped the mother survive. That was when I started galvanizing voluntary blood donors,” she says. Earlier, people had to buy blood from professional blood donors, paying a huge sum of money, but all that has changed because of the voluntary blood donors, at least in Pasighat and Aalo. In fact, Pasighat hospital authorities say that professional blood donation has stopped altogether. The woman credited with revolutionizing voluntary blood donation says: “I am not against professional blood donors. If people want to make money, I have no grudges, but someone who is already in the hospital sick, deserves better. However, there are lots of misgivings surrounding blood donation; therefore not many people are willing to donate blood. Aini faces this problem a lot. “In our close-knit Arunachalee society, a lot of people turn up for help – but ask them to donate blood and there will be few volunteers. I want that to change. And I can already see a lot of changes, which is heartening,” says Aini. Who are the voluntary blood donors? “When a family member receives blood, other members are inspired,” she says. She particularly remembers two young men who became voluntary blood donors after their relatives received blood from her. One of them, with A -ve blood group, which is a difficult blood group to get, has already donated twice. Most of the blood donors are young people. In some blood donation camps, according to Aini, there are more women than men. She says this was unthinkable even a few years ago as there is a myth that women of menstrual age already lose blood and donating blood would make them weak. Next on Aini’s agenda is to organise an all-woman blood donation camp to bust the myth that women cannot donate blood. The sole criterion is that one can donate blood only after doctors certify that one is physically fit to do so. “It took time to convince people that by becoming blood donors they not only help save lives but also get a mini health check-up in the process,” she says. Ai donates four times a year, which is the permissible limit. Her last count was 23! 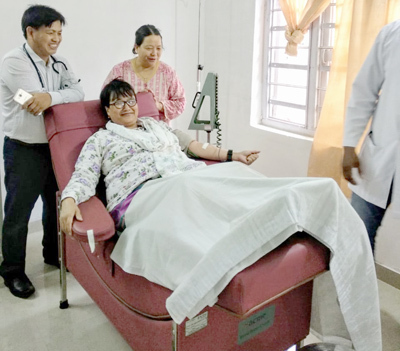 Dr Kaling Jerang, senior pathologist at Bakin Pertin General Hospital (BPGH), Pasighat, who oversees the hospital’s blood bank services, says there is a long way to go before 100% voluntary blood donation is achieved. “But as a result of Aini’s efforts, today professional blood donation in BPGH has come down to zero, and her movement’s positive efforts are encouraging other organisations to come forward for voluntary blood donation,” Dr Jerang says. The responsibility of motivating donors and organisations to voluntarily donate and organise camps was entirely put on the blood bank services staff. “Change was slow. In this scenario Aini stepped in and took over the reins of voluntary blood donation movement in the region. It’s a full-time and difficult job. Motivating donors, especially young eligible first-time donors, is not easy,” he says. “AYANG consists of mostly young voluntary blood donors who respond to calls for blood even at odd hours,” the doctor says. Dr Nabam Budh, nodal officer in the health department’s blood service, says that till about 2012, there was no voluntary blood donation, and one had to go to the professional blood donors, who charged hefty sums of money. Dr Budh says that a unit of blood used to be sold for anywhere between Rs 1,500 to Rs 35,000. Acknowledging Aini’s dedication to the cause of voluntary blood donation, Dr Budh says she has inspired many to come forward. “Hers is a completely voluntary work and her passion for voluntary blood donation is inspiring,” Dr Budh says. Aini says that as long as her health and age permit, she will continue to donate as well as create awareness on voluntary blood donation. Aini was born in Pangin when the Indo-China war of 1962 was at its peak. She was flown out of Pangin in Arunachal to Dibrugarh in Assam to escape the war when she was just a day old. She did her early studies at RKM, Aalo, and later attended Lady Keane College, Shillong. Today, she is invited to educational institutions across the country to deliver motivational talks on blood donation, and she wants to engage more with young people. “Young people are agents of change,” she says. Aini, a mother of three grown-up children, says having a supportive family helps her immensely. Her husband, Dr Tamut Taloh, a retired joint director of health services, knows the value of blood donation. Two of her children are registered blood donors. Talk about leading by example! The state has 12 blood banks, of which 10 are functional on paper while only six are actually functioning, according to government statistics. Apart from the TRIHMS, Naharlagun, and Ramakrishna Mission Hospital (RKMH), Itanagar, the district hospitals in Tawang, Changlang, Daporijo and Yingkiong, and the general hospitals in Pasighat, Ziro, Tezu and Aalo have blood banks. The blood banks of Bomdila and Roing hospitals are yet to get licences. There are two blood storage units/outlets of blood banks, one each in Ruksin and Namsai, and only RKMH has a Blood component separation unit (BCSU). The TRIHMS and the Pasighat general hospital may get BCSUs this year, according to Dr Budh. Blood banks are almost always empty due to lack of voluntary donation. Dr Budh says things are slowly changing with organisations like AYANG and Tatung Ramesh’s Arunachal Blood Donor Organization (a unit of Arunachal Vivekananda Yuva Shakti) taking it upon themselves to create awareness on voluntary blood donation by donating blood. Since people who needed blood had nowhere to go other than to the professional blood donors, he had to mobilize youths and NGOs to come forward to donate blood. However, the gap still remains huge. Last year, the total collection was about 7,000 units, whereas the requirement is for 18,000 units. According to the World Health Organisation’s (WHO) estimation, blood donation by 1% of the population can meet a nation’s most basic requirements for blood (WHO, 2010). A 2016 study by the National AIDS Control Organisation says that the annual collection of blood banks in the state was 5,033 units, which is approximately 36% of the total blood requirement based on WHO norms.